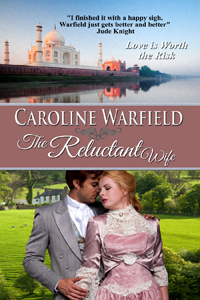 Play Is It True with today's guest Caroline Warfield author of The Reluctant Wife, a Historical Romance set in 1835. This is a game in which authors answer yes and no questions. They can elaborate on answers as much as they choose. When Bengal Army Captain Fred Wheatly, a disgraced soldier with more honor than sense, is forced to resign, and his mistress dies leaving him with two half-caste daughters to raise, he reluctantly turns to Clare Armbruster for help. But the interfering, beautiful widow demands more of him than he's ready to give. He's failed so often in the past. Clare's made mistakes as well. Can two hearts rise above past failures to forge a future together? The Children of Empire series is about three cousins torn apart by lies and deceit and driven to the far reaches of the empire, who struggle to find their way home. Each has is own problems to overcome and each one finds happiness his own way. Oh yes. Quite a lot, especially about the East India Company, Bengal, and travel between England and Calcutta. I was astonished to discover the India Mail's overland route through Suez across the desert to Cairo, then Alexandria and on to London. It was fun to put them there. some characters in this book are not human? Yes, French, but not well. I can read Latin as well but I've forgotten all my Mandarin. Hardly! I was an army brat. By the time I was six we had lived in the midwest, New England the Deep South and Europe. We recently moved here to be close to our grandson. No. I am clock impaired. Yes Thin crust with lots of fresh tomatoes and other veggies. No. Never touch the stuff, but I'm proficient with chopsticks and love most other Asian cuisine. No. We travel too much to keep one. Caroline is a RONE award winner and has five star reviews from Readers' Favorite, Night Owl Reviews, and InD'Tale. She is also a member of the writers' co-operative, the Bluestocking Belles. With partners she manages and regularly writes for both The Teatime Tattler and History Imagined. Well that was fun! Thanks for having me.